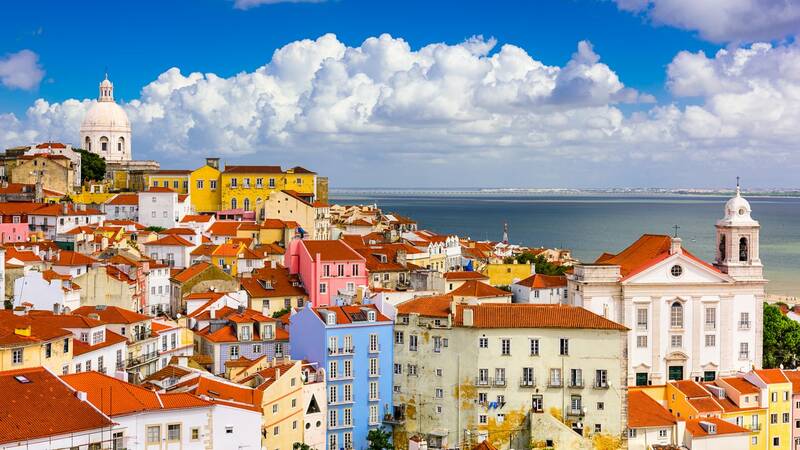 Long overlooked by travelers flocking to bigger Barcelona and ancient Athens, Lisbon is finally having its moment in the sun, thanks in no small part to more flights from the U.S. to the Portuguese capital. The hilly, coastal metropolis—one of the oldest cities in the world—has long been important due largely to its position on the Atlantic Ocean: It was from here that explorers set off centuries ago, in search of new economic opportunities and discovery. Today, the tables have turned: Lisbon itself has become the destination, rife with its own opportunity and discovery. From a convent–turned–tile museum to a no-frills seafood joint rubber-stamped by Anthony Bourdain, here are AD’s best places to stay, shop, and eat in Lisbon. The Verride Palácio de Santa Catarina building was once owned by a count, and thanks to clever touches from architect Teresa Nunes da Ponte and interior designer Andrea Previ, it makes you feel like nobility—no matter where you are in the 18-room, four-story building set in the buzzy Chiado quarter. Rooms are done in muted earth tones, which lets some of the home’s original touches shine: In the suites, da Ponte has kept wooden sculptured ceilings, 18th-century azulejo tiles, exposed stone archways, hand-painted silk de Gournay wallpaper, and Rococo-style molding. Despite its rich history, the building manages to feel modern, too, thanks to elements like AJ Lamps, a bronze check-in desk, marble tubs, and glass baubles. Don’t miss the 360-degree views of the city and Tagus River from the rooftop. A look inside Pálacio Belmonte, a trendy hotel in Lisbon’s historic Alfama District. To feel like you’re staying in someone’s home (in the best possible way), check into Pálacio Belmonte, which dates back to 1449 and took owners Mendonça and Frederic Coustouls six years to restore to its present glory. Today, the property has ten artfully furnished suites, each named after a Portuguese person of note, like Padre Himalaya (a priest and pioneer of solar energy) and Egas Moniz (a neurologist and the first Portuguese person to win a Nobel Prize). 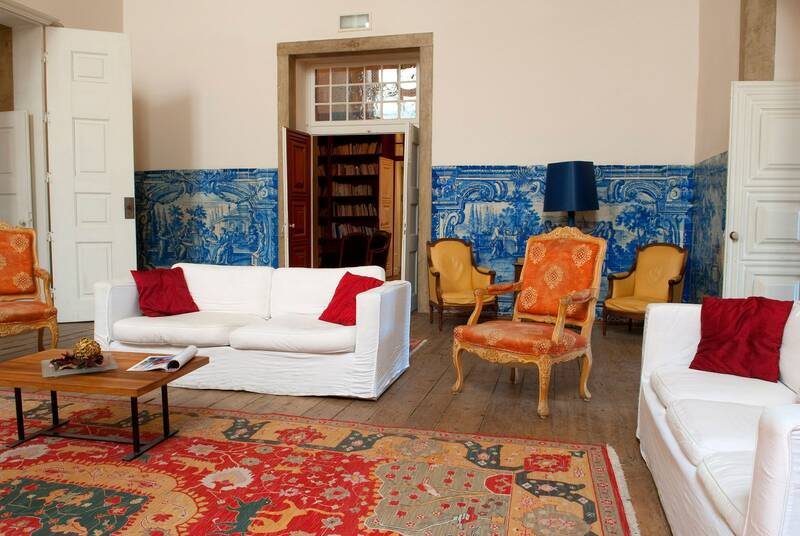 Palacio Belmonte is ideally located steps away from São Jorge Castle inside Alfama, the oldest part of the city, but you’d be forgiven for never wanting to leave: It’s easy to spend hours tracing history through the property’s 3,800 azulejo tiles, flipping through the library’s more than 4,000 books, swimming laps in the black-marble swimming pool, or sitting on a private terrace amid bougainvillea and citrus trees. Start in the southern district of Belém, known for its incredible sites of historical and architectural import: A UNESCO World Heritage site, Belém Tower—also known as the Tower of St. Vincent—was built here by military architect Francisco de Arruda in the 16th century to defend the city. The tower was built from limestone local to the area, and its rib-vaulting, crosses, and twisted sailors’ rope designs all make it emblematic of Portuguese Late Gothic Manueline style; arched windows and ornate cupolas show the influence of Moorish design. Across the street is the limestone-clad Jerónimos Monastery, which is the city’s second UNESCO World Heritage site. The monastery took a century to complete and is also designed in Manueline style, but it has a number of Gothic and Renaissance touches because of its range of architects and sculptors. Spend time at the Western portal (built by sculptor Nicolau Chanterene in 1517) and looking at the inner walls of the cloister, which show European, Moorish, Manueline, and Eastern motifs. The stone tomb of Vasco da Gama—the Portuguese explorer—is also here, in the church’s lower choir. 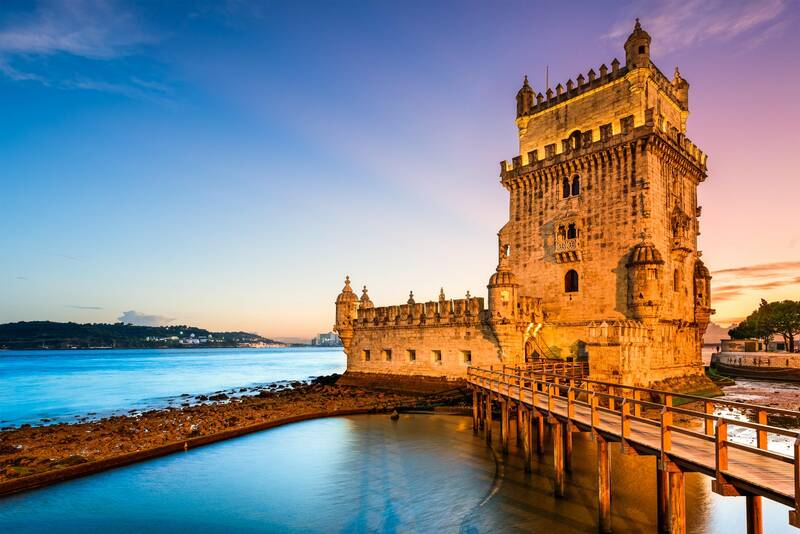 Lisbon’s Belém Tower, which is located along the Tagus River, is a UNESCO World Heritage site. Once you’re done at Jerónimos, sit for a bit next door at the famous cafe Pastéis de Belém, which has been making custard tarts, based on an ancient recipe from the monastery, since 1837. Fortified, explore what else you can in the Belém district: Nearby are the National Coach Museum, which has one of the world’s best collections of carriages and was designed by Pritzker Prize–winning Brazilian architect Paulo Mendes da Rocha; and the Museum of Art, Architecture, and Technology (MAAT) from Amanda Levete’s firm AL_A, which has a swooping façade covered in 15,000 three-dimensional white ceramic tiles and hosts some of the city’s most notable contemporary exhibits. 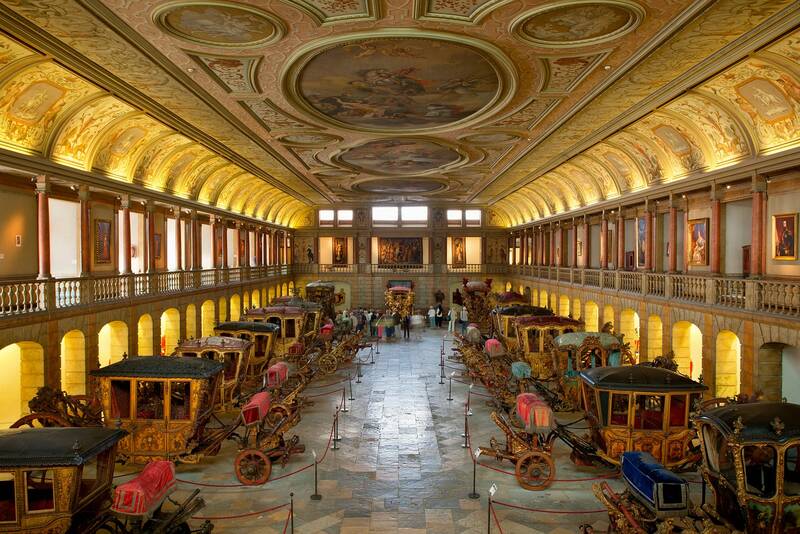 A peek inside of the National Coach Museum in Lisbon. In Lisbon, ceramic tiles are everywhere: On façades of buildings or used as coasters under a wet drink. You’ll even see them in souvenir shops, which sell tiles with soccer player Cristiano Ronaldo’s face on them (if only we were joking). But the hands-down best place to see the tiles is the National Azulejo Museum. The building itself—the former Convent of Madre Deus, founded in 1509 by Queen D. Leonor—is stunning, but it’s the breadth of the tile collection and the history of the craftsmanship that make this one of the best museums in the city: Here you can see ceramic tiles from the 15th century up to the present day. The Madre de Deus church, which once belonged to the convent and is part of the museum today, exists in full splendor, replete with gilded wood, intricate motifs of Biblical scenes, and yes, tiles. Thought your elevator was nice? Designed by Raoul Mesnier du Ponsard in a Neo-Gothic style, the Santa Justa Lift was forged from cast iron and finished with polished wood cabins. (Du Ponsard was a student of Gustave Eiffel.) Initially used to ferry passengers from the lower streets of the Baixa with the higher Carmo Square, the Santa Justa lift today serves the same purpose it did when it was inaugurated in 1902—except it’s mostly used for tourists heading up to the seven-story viewing platform above. 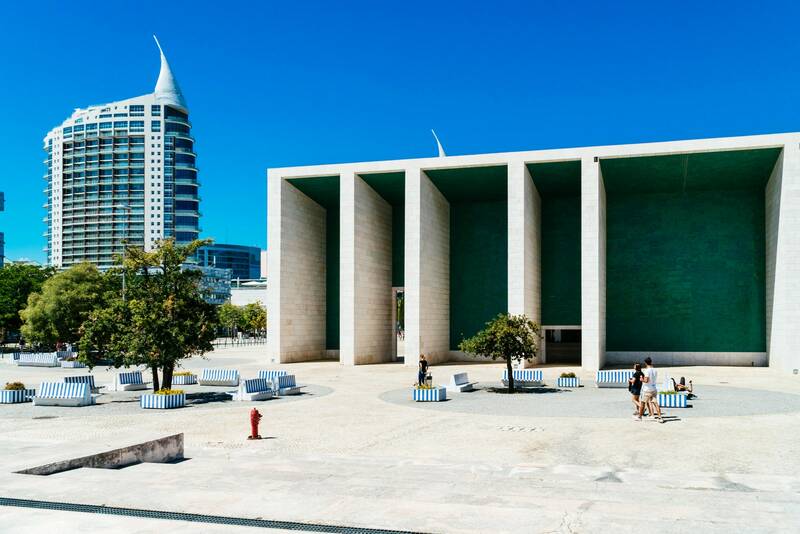 Built for the 1998 World Lisbon Expedition, the waterfront Portuguese National Pavilion remains as gobsmackingly beautiful as it did when it was first revealed by architect Álvaro Siza Vieira. Here, a thin concrete canopy is “draped” between two multicolumn porticoes to give the impression of a drooping sheet hung between two lines. Because there are no columns supporting the canopy in the middle, visitors can have an unobstructed view of the river beyond. The Álvaro Siza Vieira-designed Portuguese National Pavilion. Back in Alfama, you’ll find Casa dos Bicos, which was built in the early 16th century at the behest of the first governor of Portuguese India and restored by architect António Marques Miguel in the 1980s. The building is mostly known for its façade, which comprises thousands of small diamond-shaped pyramids; today, it serves as the head office of the José Saramago Foundation, dedicated to the life and work of the Nobel Prize–winning Portuguese author. Up the (high) hill, conveniently, is the famous Castelo de São Jorge: With parts dating back to the 6th century, the castle has served many purposes in its long life, including as a royal Moorish residence and military barracks. Cervejaria Ramiro has remained a destination for locals even after becoming a Destination for tourists thanks to Anthony Bourdain, who frequented the three-floor beer hall in 2012. The reason? 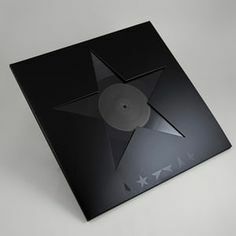 It’s just that good. Order a wide selection of seafood and get cracking: shellfish are the specialty at this family-run restaurant in the Intendente neighborhood, and paper tablecloths are swept away when you’re done so you needn’t worry about making a mess. On the opposite end of the spectrum is the high-end, two-Michelin-starred Belcanto, which has only ten tables: Inside the former men’s club in the Chiado district, chef José Avillez offers tasting menus, starters, and à la carte main courses including hay-smoked squab and red mullet with squid rice. If you can’t quite justify the splurge, Avillez has other restaurants in his empire, including Bairro do Avillez, which has a number of “concepts” under one roof. For a classic Portuguese tavern, head up to Taberna da Rua das Flores in Baixa-Chiado. Order traditional dishes such as meia-desfeita (cod salad with chickpeas) and iscas com elas(marinated liver and potatoes). The restaurant no longer takes reservations, so put your name on the list and walk two minutes down the street to By the Wine, a bar that specializes in Portuguese wines by the glass. Sit at the long bar under the arched ceiling and try everything from a Ripanço red from the Alentejo region to a sweet white from Setúbal. Tinned seafood may get a bad rap in the U.S., but it’s integral to Portugal’s history and food culture. Take home some tins from Conserveira de Lisboa, which has been in business for nearly 90 years: some of them have packaging so beautiful you won’t want to ever open them. For tiles you can take home, pay a visit to Cortiço & Netos in the Mouraria neighborhood. The shop primarily sells discontinued ceramic tiles from the last 50 years, meaning it’s possible to get a number of the same design. If you don’t want to redecorate your kitchen with a tile panel, worry not: The shop also has boxes and bins of tile one-offs for sale at different price points. Note that Cortiço & Netos is not a souvenir shop but a tile shop, so most of the tiles are just that—they don’t have padding on the back.